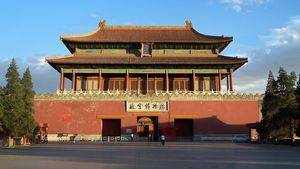 The defensive buildings of the Forbidden City do not form a geographical area strictly speaking, it is rather a set of buildings that have the same vocation and are scattered around the palace. They consist essentially of the thick wall that surrounds the complex, moats surrounding the wall, defense towers at the corners, and the gate of divine prowess, the ones guarding the entrance to the north side. The other three entrances, namely the south side (Meridian gate), the west side (Porte de la Gloire orientale) and the east side (Porte de la Gloire Occidental) respectively form part of the outer courtyard, and annexes eastern and western exteriors. 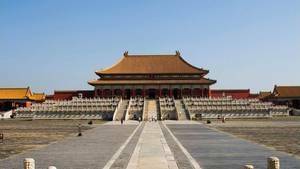 The forbidden city has experienced its defenses, it has been attacked several times in its history. These defenses were not there for decoration, despite the impression they can give nowadays. 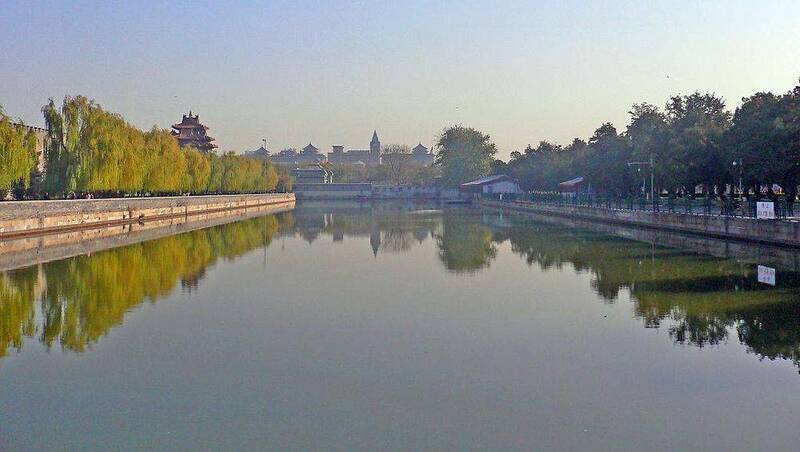 The forbidden city, which is nearly three and a half kilometers long, forms a rectangle in the heart of Beijing. It measures 10 meters high and 6 wide and is pierced with only 4 doors, one on each side. 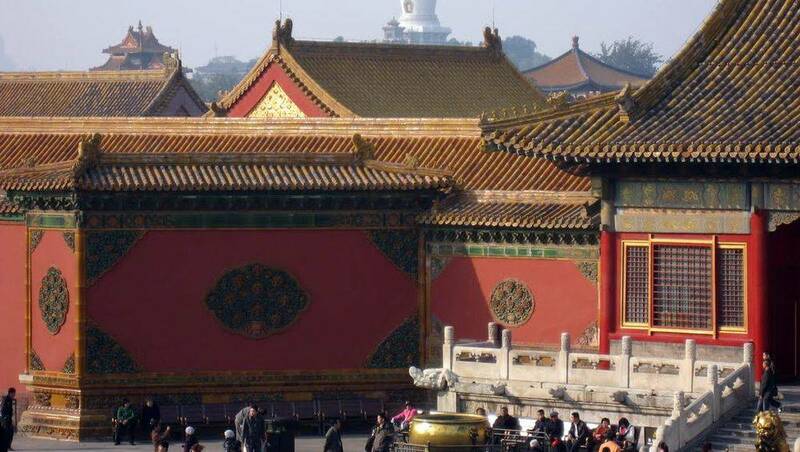 The southern gate is the main gate, overlooking Tian'anmen Square and is called the "Wu men" in Chinese, Meridian Gate. In the north is the Gate of Divine Prowess. On the sides the doors are not centered, they are close to the South angle. In the West, the "Gate of Western Glory" and the East Gateery Gate (East Flowery Gate, in Chinese "Xihuamen" and "Donghuamen") in the East. . These 4 doors are of course not a simple passage in the wall, they are real small bastions of which the south is particularly imposing. This enclosure is protected by 52-meter-wide moat exactly over which 3 bridges pass to access the West, North and East gates. 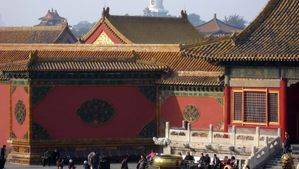 In the South, Tian'anmen Square serves as protection. Founded in 1420 during the eighteenth year of the reign of emperor Yongle (1403-1424) of the Ming dynasty (1368-1644), it measures 3800 m in length for a width of 52 m. It was built for security purposes, with both banks arranged so as to make it impossible to cross it without filling it. The water flows from the northwest to the southeast. It is from these waters that the river of golden waters, the artificial river that crosses the Forbidden City, is drawn. An emperor had there installed valves to regulate their quantities. 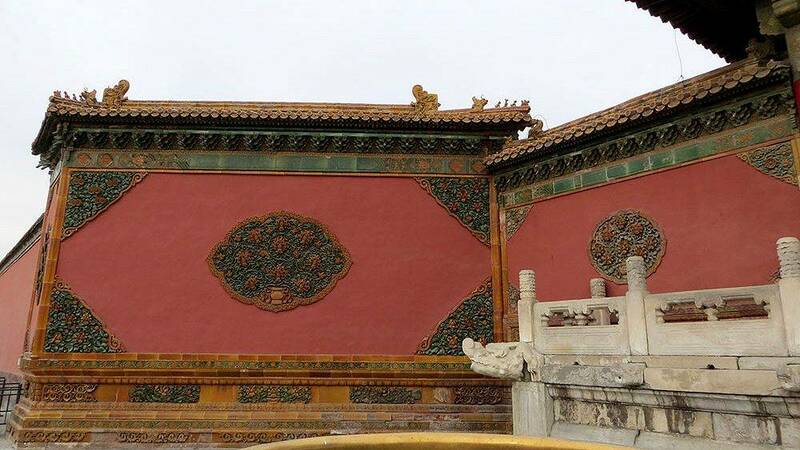 The defensive towers at each corner of the Forbidden City. 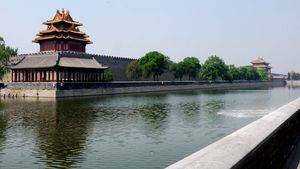 At the four corners of the high wall were built corner towers (in 1420, the creation of the Forbidden City). They were rebuilt during the Qing Dynasty (1644-1911). As part of the Forbidden City, they served as defensive towers in the same way as the rampart and the ditch. They rest on at their bases on a Buddhist building surrounded by stone columns. 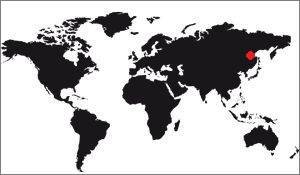 Here is the legend to their subjects. 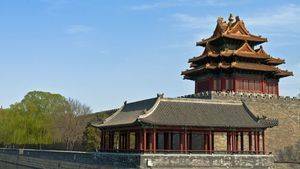 Zhudi, Emperor Yongle of the Ming Dynasty, ordered the construction of these 4 towers, each with 9 beams, 18 posts and 72 edges. The chief commander of the project brought together all the carpenters and gave them three months to fulfill this mission. The problem was that the work required was really complex, as no one had done so. Worried, a carpenter went to meet an old man who was selling locusts and bought him a locust cage. To his surprise, this delicate cage had 9 beams, 18 posts and 72 bones, so the brave carpenter used it as a model to propose the scheme of the tower. It is said that the old man was the father of builders, Luban. This is certainly not true. However, the four corner towers of the Forbidden City have the flexibility of traditional wooden structure constructions and form a skilful combination between decoration and defensive function of the building. 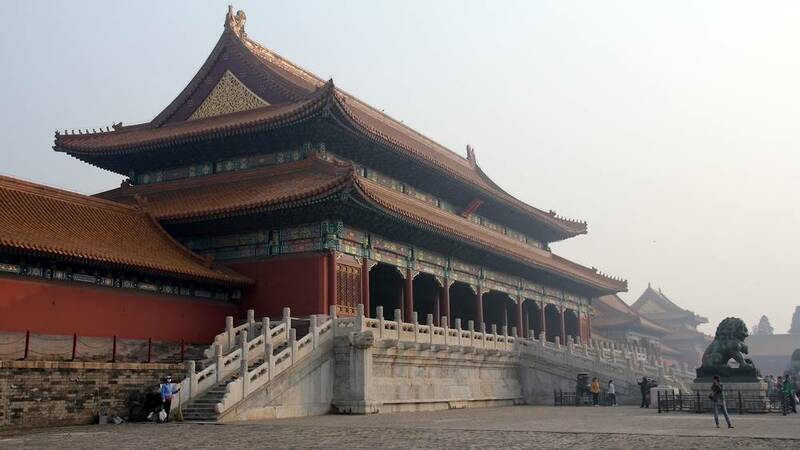 You can also see on this subject the architecture of the Forbidden City, there is a chapter on these 72 beams. It is the northern gate of the Imperial Palace, and it is also called the Gate of Military Engineering. It was originally called the door of occult power until it was restored in the 17th century. Its tower once contained a drum and a bell that was used to announce the time. Thus it sounded a blow at nightfall, and then recommenced at the rising of the Sun. At night it sounded once an hour. This door was not used by the emperors who passed through the South Gate.